These highlights do not include all the information needed to use Menactra ® safely and effectively. 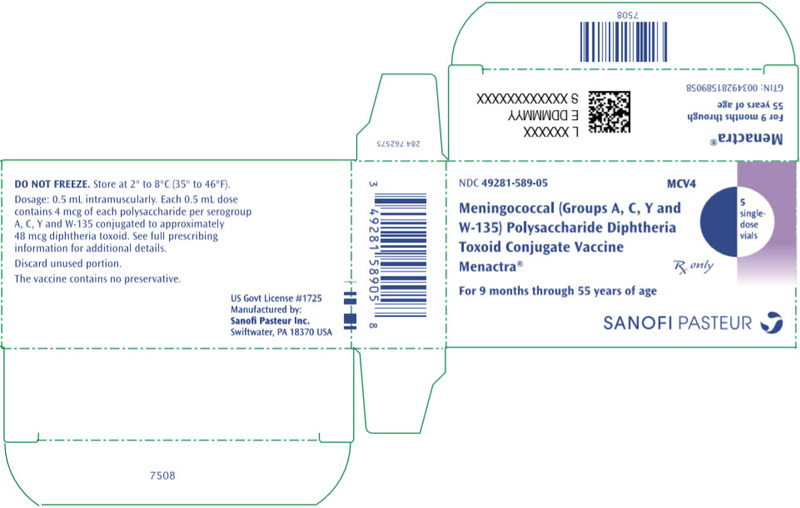 See full prescribing information for Menactra vaccine. Children 9 through 23 months of age: Two doses, three months apart. Individuals 2 through 55 years of age: A single dose. A single booster dose may be given to individuals 15 through 55 years of age at continued risk for meningococcal disease, if at least 4 years have elapsed since the prior dose. To report SUSPECTED ADVERSE REACTIONS, contact Sanofi Pasteur Inc. at 1-800-822-2463 (1-800-VACCINE) or VAERS at 1-800-822-7967 or http://vaers.hhs.gov. Menactra®, Meningococcal (Groups A, C, Y and W-135) Polysaccharide Diphtheria Toxoid Conjugate Vaccine, is indicated for active immunization to prevent invasive meningococcal disease caused by Neisseria meningitidis serogroups A, C, Y and W-135. Menactra is approved for use in individuals 9 months through 55 years of age. Menactra does not prevent N meningitidis serogroup B disease. Menactra is a clear to slightly turbid solution. Parenteral drug products should be inspected visually for particulate matter and discoloration prior to administration, whenever solution and container permit. If any of these conditions exist, the vaccine should not be administered. Withdraw the 0.5 mL dose of vaccine from the single-dose vial using a sterile needle and syringe. Menactra is administered as a 0.5 mL dose by intramuscular injection. Do not administer this product intravenously or subcutaneously. In children 9 through 23 months of age, Menactra is given as a 2-dose series three months apart. Individuals 2 through 55 years of age, Menactra is given as a single dose. Severe allergic reaction (eg, anaphylaxis) after a previous dose of a meningococcal capsular polysaccharide-, diphtheria toxoid- or CRM197-containing vaccine, or to any component of Menactra [see Description (11)]. Persons previously diagnosed with Guillain-Barré syndrome (GBS) may be at increased risk of GBS following receipt of Menactra. The decision to give Menactra should take into account the potential benefits and risks. GBS has been reported in temporal relationship following administration of Menactra (1) (2). The risk of GBS following Menactra vaccination was evaluated in a post-marketing retrospective cohort study [see Post-Marketing Experience (6.2)]. Some individuals with altered immunocompetence, including some individuals receiving immunosuppressant therapy, may have reduced immune responses to Menactra. Menactra may not protect all recipients. Syncope (fainting) has been reported following vaccination with Menactra. Procedures should be in place to prevent falling injury and manage syncopal reactions. The safety of Menactra was evaluated in four clinical studies that enrolled 3721 participants who received Menactra at 9 and 12 months of age. At 12 months of age these children also received one or more other recommended vaccines [Measles, Mumps, Rubella and Varicella Virus Vaccine Live (MMRV) or Measles, Mumps, and Rubella Virus Vaccine (MMR) and Varicella Virus Vaccine Live (V) each manufactured by Merck & Co., Inc., Pneumococcal 7-valent Conjugate Vaccine (Diphtheria CRM197 Protein) manufactured by Wyeth Pharmaceuticals Inc. (PCV7), Hepatitis A Vaccine manufactured by Merck & Co., Inc. (HepA). A control group of 997 children was enrolled at 12 months of age and received two or more childhood vaccines [MMRV (or MMR+V), PCV7, HepA] at 12 months of age [see Concomitant Vaccine Administration (14.3)]. Three percent of individuals received MMR and V, instead of MMRV, at 12 months of age. The primary safety study was a controlled trial that enrolled 1256 children who received Menactra at 9 and 12 months of age. At 12 months of age these children received MMRV (or MMR+V), PCV7 and HepA. A control group of 522 children received MMRV, PCV7 and HepA. Of the 1778 children, 78% of participants (Menactra, N=1056; control group, N=322) were enrolled at United States (US) sites and 22% at a Chilean site. (Menactra, N=200; control group, N=200). The safety of Menactra was evaluated in eight clinical studies that enrolled 10,057 participants aged 2-55 years who received Menactra and 5,266 participants who received Menomune® – A/C/Y/W-135, Meningococcal Polysaccharide Vaccine, Groups A, C, Y and W-135 Combined. There were no substantive differences in demographic characteristics between the vaccine groups. Among Menactra recipients 2-55 years of age 24.0%, 16.2%, 40.4% and 19.4% were in the 2-10, 11-14, 15-25 and 26-55-year age groups, respectively. Among Menomune – A/C/Y/W-135 recipients 2-55 years of age 42.3%, 9.3%, 30.0% and 18.5% were in the 2-10, 11-14, 15-25 and 26-55-year age groups, respectively. The three primary safety studies were randomized, active-controlled trials that enrolled participants 2-10 years of age (Menactra, N=1713; Menomune – A/C/Y/W-135, N=1519), 11-18 years of age (Menactra, N=2270; Menomune – A/C/Y/W-135, N=972) and 18-55 years of age (Menactra, N=1384; Menomune – A/C/Y/W-135, N=1170), respectively. Of the 3232 children 2-10 years of age, 68% of participants (Menactra, N=1164; Menomune – A/C/Y/W-135, N=1031) were enrolled at US sites and 32% (Menactra, N=549; Menomune – A/C/Y/W-135, N=488) of participants at a Chilean site. The median ages in the Chilean and US subpopulations were 5 and 6 years, respectively. All adolescents and adults were enrolled at US sites. As the route of administration differed for the two vaccines (Menactra given intramuscularly, Menomune – A/C/Y/W-135 given subcutaneously), study personnel collecting the safety data differed from personnel administering the vaccine. In an open-label trial conducted in the US, 834 individuals were enrolled to receive a single dose of Menactra 4-6 years after a prior dose. The median age of participants was 17.1 years at the time of the booster dose. Participants were monitored after each vaccination for 20 or 30 minutes for immediate reactions, depending on the study. Solicited injection site and systemic reactions were recorded in a diary card for 7 consecutive days after each vaccination. Participants were monitored for 28 days (30 days for infants and toddlers) for unsolicited adverse events and for 6 months post-vaccination for visits to an emergency room, unexpected visits to an office physician, and serious adverse events. Unsolicited adverse event information was obtained either by telephone interview or at an interim clinic visit. Information regarding adverse events that occurred in the 6-month post-vaccination time period was obtained via a scripted telephone interview. Serious adverse events (SAEs) were reported during a 6-month time period following vaccinations in individuals 9 months through 55 years of age. In children who received Menactra at 9 months and at 12 months of age, SAEs occurred at a rate of 2.0% - 2.5%. In participants who received one or more childhood vaccine(s) (without co-administration of Menactra) at 12 months of age, SAEs occurred at a rate of 1.6% - 3.6%, depending on the number and type of vaccines received. In children 2-10 years of age, SAEs occurred at a rate of 0.6% following Menactra and at a rate of 0.7% following Menomune – A/C/Y/W-135. In adolescents 11 through 18 years of age and adults 18 years through 55 years of age, SAEs occurred at a rate of 1.0% following Menactra and at a rate of 1.3% following Menomune – A/C/Y/W-135. In adolescents and adults, SAEs occurred at a rate of 1.3% following booster vaccination with Menactra. The most frequently reported solicited injection site and systemic adverse reactions within 7 days following vaccination in children 9 months and 12 months of age (Table 1) were injection site tenderness and irritability. The most frequently reported solicited injection site and systemic adverse reactions in US children aged 2-10 years of age (Table 2) were injection site pain and irritability. Diarrhea, drowsiness, and anorexia were also common. The most commonly reported solicited injection site and systemic adverse reactions in adolescents, ages 11-18 years (Table 3), and adults, ages 18-55 years (Table 4), after a single dose were injection site pain, headache and fatigue. Except for redness in adults, injection site reactions were more frequently reported after Menactra vaccination than after Menomune – A/C/Y/W-135 vaccination. N = The number of participants with available data. Grade 2: cries and protests when injection site is touched, Grade 3: cries when injected limb is moved, or the movement of the injected limb is reduced. Grade 2: ≥1.0 inches to <2.0 inches, Grade 3: ≥2.0 inches. Grade 2: requires increased attention, Grade 3: inconsolable. Grade 2: 1 to 3 hours, Grade 3: >3 hours. Grade 2: not interested in surroundings or did not wake up for a feed/meal, Grade 3: sleeping most of the time or difficult to wake up. Grade 2: missed 1 or 2 feeds/meals completely, Grade 3: refuses ≥3 feeds/meals or refuses most feeds/meals. Grade 2: 2 to 5 episodes per 24 hours, Grade 3: ≥6 episodes per 24 hours or requiring parenteral hydration. Grade 2: >38.5°C to ≤39.5°C, Grade 3: >39.5°C. Note: During the study Grade 1, Grade 2, and Grade 3 were collected as Mild, Moderate, and Severe respectively. N = The total number of participants reporting at least one solicited reaction. The median age of participants was 6 years in both vaccine groups. Grade 2: interferes with normal activities, Grade 3: disabling, unwilling to move arm. Grade 2: 1.0-2.0 inches, Grade 3: >2.0 inches. Grade 2: 1-3 hours duration, Grade 3: >3 hours duration. Grade 2: 3-4 episodes, Grade 3: ≥5 episodes. Grade 2: interferes with normal activities, Grade 3: disabling, unwilling to engage in play or interact with others. Grade 2: skipped 2 meals, Grade 3: skipped ≥3 meals. Grade 2: decreased range of motion due to pain or discomfort, Grade 3: unable to move major joints due to pain. Oral equivalent temperature; Grade 2: 38.4°C to 39.4ºC, Grade 3: ≥39.5ºC. These solicited adverse events were reported as present or absent only. Grade 2: 2 episodes, Grade 3: ≥3 episodes. Grade 2: interferes with or limits usual arm movement, Grade 3: disabling, unable to move arm. Denotes p <0.05 level of significance. The p-values were calculated for each category and severity using Chi Square test. Grade 2: interferes with normal activities, Grade 3: requiring bed rest. Oral equivalent temperature; Grade 2: 38.5°C to 39.4ºC, Grade 3: ≥39.5ºC. Oral equivalent temperature; Grade 2: 39.0°C to 39.9ºC, Grade 3: ≥40.0ºC. For a description of the study design and number of participants, [see Clinical Trials Experience, Booster Vaccination Study (6.1)]. The most common solicited injection site and systemic reactions within 7 days of vaccination were pain (60.2%) and myalgia (42.8%), respectively. Overall rates of solicited injection site reactions and solicited systemic reactions were similar to those observed in adolescents and adults after a single Menactra dose. The majority of solicited reactions were Grade 1 or 2 and resolved within 3 days. In a clinical study, rates of local and systemic reactions after Menactra and Tetanus and Diphtheria Toxoid Adsorbed (Td) vaccine manufactured by Sanofi Pasteur Inc. were compared [see Drug Interactions (7), and Concomitant Vaccine Administration (14.3) for study description]. Injection site pain was reported more frequently after Td vaccination than after Menactra vaccination (71% versus 53%). The overall rate of systemic adverse events was higher when Menactra and Td vaccines were given concomitantly than when Menactra was administered 28 days after Td vaccine (59% versus 36%). In both groups, the most common reactions were headache (Menactra + Td vaccine, 36%; Td vaccine + Placebo, 34%; Menactra alone, 22%) and fatigue (Menactra + Td vaccine, 32%; Td vaccine + Placebo, 29%; Menactra alone, 17%). Fever ≥40.0ºC occurred at ≤0.5% in all groups. In a clinical study, rates of local and systemic reactions after Menactra and Typhim Vi® [Typhoid Vi Polysaccharide Vaccine] (Typhoid), produced by Sanofi Pasteur SA were compared [see Drug Interactions (7) and Concomitant Vaccine Administration (14.3)] for a description of the concomitantly administered vaccine, study design and number of participants. More participants experienced pain after Typhoid vaccination than after Menactra vaccination (Typhoid + Placebo, 76% versus Menactra + Typhoid, 47%). The majority (70%-77%) of injection site solicited reactions for both groups at either injection site were reported as Grade 1 and resolved within 3 days post-vaccination. In both groups, the most common systemic reaction was headache (Menactra + Typhoid, 41%; Typhoid + Placebo, 42%; Menactra alone, 33%) and fatigue (Menactra + Typhoid, 38%; Typhoid + Placebo, 35%; Menactra alone, 27%). Fever ≥40.0ºC and seizures were not reported in either group. In addition to reports in clinical trials, worldwide voluntary adverse events reports received since market introduction of Menactra are listed below. This list includes serious events and/or events which were included based on severity, frequency of reporting or a plausible causal connection to Menactra. Because these events were reported voluntarily from a population of uncertain size, it is not possible to reliably estimate their frequency or establish a causal relationship to vaccination. Large injection site reactions, extensive swelling of the injected limb (may be associated with erythema, warmth, tenderness or pain at the injection site). The risk of GBS following receipt of Menactra was evaluated in a US retrospective cohort study using healthcare claims data from 9,578,688 individuals 11 through 18 years of age, of whom 1,431,906 (15%) received Menactra. Of 72 medical chart-confirmed GBS cases, none had received Menactra within 42 days prior to symptom onset. An additional 129 potential cases of GBS could not be confirmed or excluded due to absent or insufficient medical chart information. In an analysis that took into account the missing data, estimates of the attributable risk of GBS ranged from 0 to 5 additional cases of GBS per 1,000,000 vaccinees within the 6-week period following vaccination. Menactra vaccine was concomitantly administered with Typhim Vi® [Typhoid Vi Polysaccharide Vaccine] (Typhoid) and Tetanus and Diphtheria Toxoids Adsorbed, For Adult Use (Td) vaccine, in individuals 18 through 55 and 11 through 17 years of age, respectively. In children 4 through 6 years of age, Menactra was co-administered with DAPTACEL, and in children younger than 2 years of age, Menactra was co-administered with one or more of the following vaccines: PCV7, MMR, V, MMRV, or HepA [see Clinical Studies (14) and Adverse Reactions (6)]. When Menactra and DAPTACEL are to be administered to children 4 through 6 years of age, preference should be given to simultaneous administration of the 2 vaccines or administration of Menactra prior to DAPTACEL. Administration of Menactra one month after DAPTACEL has been shown to reduce meningococcal antibody responses to Menactra. Data are not available to evaluate the immune response to Menactra administered to younger children following DAPTACEL or to Menactra administered to persons <11 years of age following other diphtheria toxoid-containing vaccines [see Clinical Studies (14.3)]. Pneumococcal antibody responses to some serotypes in PCV7 were decreased following co-administration of Menactra and PCV7 [see Concomitant Vaccine Administration (14.3)]. Do not mix Menactra with other vaccines in the same syringe. When Menactra is administered concomitantly with other injectable vaccines, the vaccines should be administered with different syringes and given at separate injection sites. Immunosuppressive therapies, including irradiation, antimetabolites, alkylating agents, cytotoxic drugs, and corticosteroids (used in greater than physiologic doses) may reduce the immune response to vaccines. There is a pregnancy exposure registry that monitors pregnancy outcomes in women exposed to Menactra during pregnancy. To enroll in or obtain information about the registry, call Sanofi Pasteur at 1-800-822-2463. All pregnancies have a risk of birth defect, loss, or other adverse outcomes. In the US general population, the estimated background risk of major birth defects and miscarriage in clinically recognized pregnancies is 2% to 4% and 15% to 20%, respectively. There are no adequate and well-controlled studies of Menactra administration in pregnant women in the US. Available data suggest that rates of major birth defects and miscarriage in women who received Menactra 30 days prior to pregnancy or during pregnancy are consistent with estimated background rates. A developmental toxicity study was performed in female mice given 0.1 mL (in divided doses) of Menactra prior to mating and during gestation (a single human dose is 0.5 mL). The study revealed no evidence of harm to the fetus due to Menactra [see Animal Data (8.1)]. A pregnancy registry spanning 11 years (2005-2016) included 222 reports of exposure to Menactra from 30 days before or at any time during pregnancy. Of these reports, 87 had known pregnancy outcomes available and were enrolled in the pregnancy registry prior to the outcomes being known. Outcomes among these prospectively followed pregnancies included 2 major birth defects and 6 miscarriages. A developmental toxicity study was performed in female mice. The animals were administered 0.1 mL of Menactra (in divided doses) at each of the following time points: 14 days prior to mating, and on Days 6 and 18 of gestation (a single human dose is 0.5 mL). There were no vaccine-related fetal malformations or variations, and no adverse effects on pre-weaning development observed in the study. The developmental and health benefits of breastfeeding should be considered along with the mother's clinical need for Menactra and any potential adverse effects on the breastfed child from Menactra. Data are not available to assess the effects of Menactra on the breastfed infant or on milk production/excretion. Menactra is not approved for use in infants under 9 months of age. Available data show that infants administered three doses of Menactra (at 2, 4, and 6 months of age) had diminished responses to each meningococcal vaccine serogroup compared to older children given two doses at 9 and 12 months of age. Safety and effectiveness of Menactra in adults older than 55 years of age have not been established. Menactra is a sterile, intramuscularly administered vaccine that contains N meningitidis serogroup A, C, Y and W-135 capsular polysaccharide antigens individually conjugated to diphtheria toxoid protein. N meningitidis A, C, Y and W-135 strains are cultured on Mueller Hinton agar (3) and grown in Watson Scherp (4) media containing casamino acid. The polysaccharides are extracted from the N meningitidis cells and purified by centrifugation, detergent precipitation, alcohol precipitation, solvent extraction and diafiltration. To prepare the polysaccharides for conjugation, they are depolymerized, derivatized, and purified by diafiltration. Diphtheria toxin is derived from Corynebacterium diphtheriae grown in modified culture medium containing hydrolyzed casein (5) and is detoxified using formaldehyde. The diphtheria toxoid protein is purified by ammonium sulfate fractionation and diafiltration. The derivatized polysaccharides are covalently linked to diphtheria toxoid and purified by serial diafiltration. The four meningococcal components, present as individual serogroup-specific glycoconjugates, compose the final formulated vaccine. No preservative or adjuvant is added during manufacture. Each 0.5 mL dose may contain residual amounts of formaldehyde of less than 2.66 mcg (0.000532%), by calculation. Potency of Menactra is determined by quantifying the amount of each polysaccharide antigen that is conjugated to diphtheria toxoid protein and the amount of unconjugated polysaccharide present. Menactra is manufactured as a sterile, clear to slightly turbid liquid. Each 0.5 mL dose of vaccine is formulated in sodium phosphate buffered isotonic sodium chloride solution to contain 4 mcg each of meningococcal A, C, Y and W-135 polysaccharides conjugated to approximately 48 mcg of diphtheria toxoid protein carrier. The presence of bactericidal anti-capsular meningococcal antibodies has been associated with protection from invasive meningococcal disease (6) (7). Menactra induces the production of bactericidal antibodies specific to the capsular polysaccharides of serogroups A, C, Y and W-135. Menactra has not been evaluated for carcinogenic or mutagenic potential, or for impairment of male fertility. A developmental animal toxicity study showed that Menactra had no effects on female fertility in mice [see Pregnancy (8.1)]. The response to vaccination following two doses of vaccine administered to children 9 and 12 months of age and following one dose of vaccine administered to children 2 through 10 years of age was evaluated by the proportion of participants having an SBA-H antibody titer of 1:8 or greater, for each serogroup. In individuals 11 through 55 years of age, the response to vaccination with a single dose of vaccine was evaluated by the proportion of participants with a 4-fold or greater increase in bactericidal antibody to each serogroup as measured by SBA-BR. For individuals 2 through 55 years of age, vaccine efficacy after a single dose was inferred from the demonstration of immunologic equivalence to a US-licensed meningococcal polysaccharide vaccine, Menomune – A/C/Y/W-135 vaccine as assessed by SBA. In a randomized, US, multi-center trial, children received Menactra at 9 months and 12 months of age. The first Menactra dose was administered alone, followed by a second Menactra dose given alone (N=404), or with MMRV (N=302), or with PCV7 (N=422). For all participants, sera were obtained approximately 30 days after last vaccination. There were no substantive differences in demographic characteristics between the vaccine groups. The median age range for administration of the first dose of Menactra was 278-279 days of age. Serum bactericidal assay with an exogenous human complement (SBA-H) source. N=Number of participants with at least one valid serology result from a blood sample obtained between Days 30 to 44 post vaccination. 95% CIs for the proportions are calculated based on the Clopper-Pearson Exact method and normal approximation for that of the GMTs. The proportion of participants achieving an SBA-H titer of at least 1:8 thirty days after the second dose of Menactra. Administration of Menactra to children at 12 months and 15 months of age was evaluated in a US study. Prior to the first dose, 33.3% [n=16/48] of participants had an SBA-H titer ≥1:8 to Serogroup A, and 0-2% [n=0-1 of 50-51] to Serogroups C, Y and W-135. After the second dose, percentages of participants with an SBA-H titer ≥1:8 were: 85.2%, Serogroup A [n=46/54]; 100.0%, Serogroup C [n=54/54]; 96.3%, Serogroup Y [n=52/54]; 96.2%, Serogroup W-135 [n=50/52]. In each of the trials, there were no substantive differences in demographic characteristics between the vaccine groups, between immunogenicity subsets or the overall study population. In the study of children 2 through 10 years of age, the median age of participants was 3 years; 95% completed the study. In the adolescent trial, the median age for both groups was 14 years; 99% completed the study. In the adult trial, the median age for both groups was 24 years; 94% completed the study. Of 1408 enrolled children 2 through 10 years of age, immune responses evaluated in a subset of Menactra participants (2 through 3 years of age, n=52; 4-10 years of age, n=84) and Menomune – A/C/Y/W-135 participants (2 through 3 years of age, n=53; 4-10 years of age, n=84) were comparable for all four serogroups (Table 6). N=Number of subset participants with at least one valid serology result at Day 0 and Day 28. The 95% CI for the Geometric Mean Titer (GMT) was calculated based on an approximation to the normal distribution. The proportion of participants achieving an SBA-H titer of at least 1:8 was assessed using a 10% non-inferiority margin and a one-sided Type 1 error rate of 0.025. In the subset of participants 2 through 3 years of age with undetectable pre-vaccination titers (ie, SBA-H titers <1:4 at Day 0), seroconversion rates (defined as the proportions of participants with SBA-H titers ≥1:8 by Day 28) were similar between the Menactra and Menomune – A/C/Y/W-135 recipients. Menactra participants achieved seroconversion rates of: 57%, Serogroup A (n=12/21); 62%, Serogroup C (n=29/47); 84%, Serogroup Y (n=26/31); 53%, Serogroup W-135 (n=20/38). The seroconversion rates for Menomune – A/C/Y/W-135 recipients were: 55%, Serogroup A (n=16/29); 30%, Serogroup C (n=13/43); 57%, Serogroup Y (n=17/30); 26%, Serogroup W-135 (n=11/43). In the subset of participants 4 through 10 years of age with undetectable pre-vaccination titers (ie, SBA-H titers <1:4 at Day 0), seroconversion rates (defined as the proportions of participants with SBA-H titers ≥1:8 by Day 28) were similar between the Menactra and Menomune – A/C/Y/W-135 recipients. Menactra participants achieved seroconversion rates of: 69%, Serogroup A (n=11/16); 81%, Serogroup C (n=50/62); 98%, Serogroup Y (n=45/46); 69%, Serogroup W-135 (n=27/39). The seroconversion rates for Menomune – A/C/Y/W-135 recipients were: 48%, Serogroup A (n=10/21); 38%, Serogroup C (n=19/50); 84%, Serogroup Y (n=38/45); 68%, Serogroup W-135 (n=26/38). Results from the comparative clinical trial conducted in 881 adolescents aged 11 through 18 years showed that the immune responses to Menactra and Menomune – A/C/Y/W-135 were similar for all four serogroups (Table 7). In participants with undetectable pre-vaccination titers (ie, SBA-BR titers <1:8 at Day 0), seroconversion rates (defined as the proportions of participants achieving a ≥4-fold rise in SBA-BR titers by Day 28) were similar between the Menactra and Menomune – A/C/Y/W-135 recipients. Menactra participants achieved seroconversion rates of: 100%, Serogroup A (n=81/81); 99%, Serogroup C (n=153/155); 98%, Serogroup Y (n=60/61); 98%, Serogroup W-135 (n=161/164). The seroconversion rates for Menomune – A/C/Y/W-135 recipients were: 100%, Serogroup A (n=93/93); 99%, Serogroup C (n=151/152); 100%, Serogroup Y (n=47/47); 99%, Serogroup W-135 (n=138/139). Results from the comparative clinical trial conducted in 2554 adults aged 18 through 55 years showed that the immune responses to Menactra and Menomune – A/C/Y/W-135 were similar for all four serogroups (Table 7). Serum bactericidal assay with baby rabbit complement (SBA-BR). Menactra was non-inferior to Menomune – A/C/Y/W-135. Non-inferiority was assessed by the proportion of participants with a 4-fold or greater rise in SBA-BR titer for N meningitidis serogroups A, C, Y and W-135 using a 10% non-inferiority margin and a one-sided Type I error rate of 0.05. In participants with undetectable pre-vaccination titers (ie, SBA-BR titers <1:8 at Day 0), seroconversion rates (defined as the proportions of participants achieving a ≥4-fold rise in SBA-BR titers by Day 28) were similar between the Menactra and Menomune – A/C/Y/W-135 recipients. Menactra participants achieved seroconversion rates of: 100%, Serogroup A (n=156/156); 99%, Serogroup C (n=343/345); 91%, Serogroup Y (n=253/279); 97%, Serogroup W-135 (n=360/373). The seroconversion rates for Menomune – A/C/Y/W-135 recipients were: 99%, Serogroup A (n=143/144); 98%, Serogroup C (n=297/304); 97%, Serogroup Y (n=221/228); 99%, Serogroup W-135 (n=325/328). For a description of the study design and number of participants, [see Clinical Trials Experience, Booster Vaccination Study (6.1).] Prior to revaccination, the percentage of participants (n=781) with an SBA-H titer ≥1:8 were 64.5%, 44.2%, 38.7%, and 68.5% for Serogroups A, C, Y and W-135, respectively. Among the subset of trial participants (n=112) for whom SBA-H responses at Day 6 were assessed, 86.6%, 91.1%, 94.6%, and 92.0% achieved a ≥4-fold rise in SBA-H titer for Serogroups A, C, Y and W-135, respectively. The proportions of participants (n=781) who achieved a ≥4-fold rise in SBA-H titer by Day 28 were 95.0%, 95.3%, 97.1%, and 96% for Serogroups A, C, Y and W-135, respectively. The proportions of participants who achieved an SBA-H titer ≥1:8 by Day 28 were >99% for each serogroup. In a US, active-controlled trial, 1179 children received Menactra at 9 months and 12 months of age. At 12 months of age these children received Menactra concomitantly with MMRV (N=616), or MMR + V (N=48), or PCV7 (N=250). Another group of 12-month old children received MMRV + PCV7 (N=485). Sera were obtained approximately 30 days after the last vaccinations. Measles, mumps, rubella and varicella antibody responses among children who received Menactra and MMRV (or MMR and V) were comparable to corresponding antibody responses among children who received MMRV and PCV7. When Menactra was given concomitantly with PCV7, the non-inferiority criteria for comparisons of pneumococcal IgG GMCs (upper limit of the two-sided 95% CI of the GMC ratio ≤2) were not met for 3 of 7 serotypes (4, 6B, 18C). In a subset of participants with available sera, pneumococcal opsonophagocytic assay GMT data were consistent with IgG GMC data. In a double-blind, randomized, controlled trial, 1021 participants aged 11 through 17 years received Td vaccine and Menactra concomitantly (N=509), or Td vaccine followed one month later by Menactra (N=512). Sera were obtained approximately 28 days after each respective vaccination. The proportions of participants with a 4-fold or greater increase in SBA-BR titer to meningococcal Serogroups C, Y and W-135 were higher when Menactra was given concomitantly with Td vaccine (86%-96%) than when Menactra was given one month following Td vaccine (65%-91%). Anti-tetanus and anti-diphtheria antibody responses were similar in both study groups. In a double-blind, randomized, controlled trial, 945 participants aged 18 through 55 years received Typhim Vi and Menactra concomitantly (N=469), or Typhim Vi followed one month later by Menactra (N=476). Sera were obtained approximately 28 days after each respective vaccination. The antibody responses to Menactra and to Typhim Vi components were similar in both study groups. When Menactra was administered 30 days after DAPTACEL (and IPV) [Group A], significantly lower SBA-H GMTs to all 4 meningococcal serogroups were observed compared to Menactra (and IPV) administered 30 days prior to DAPTACEL [Group C]. When Menactra was administered concomitantly with DAPTACEL [Group B], SBA-H GMTs to meningococcal serogroups A, C, and W-135 were non-inferior to those observed after Menactra (and IPV) [Group C]. The non-inferiority criterion was marginally missed for meningococcal serogroup Y. Non-inferiority of SBA-H GMTs following concomitant administration of Menactra and DAPTACEL compared to those after concomitant Menactra and IPV was concluded if the upper limit of the 2-sided 95% CI of (GMTGroup C divided by GMTGroup B) computed separately for each of the serogroups was <2. The respective SBA-H GMTs and proportion (%) of Group A, B, and C study participants achieving an SBA-H titer of ≥1:8 are displayed in Table 8. N=Total number of the subjects in the study population per group. The proportion of participants achieving an SBA-H titer of at least 1:8, 30 days after Menactra. When Menactra was administered concomitantly with DAPTACEL, antibody responses to three of the pertussis antigens (pertussis toxin, filamentous hemagglutinin, and pertactin) (GMCs), tetanus toxin (% participants with antibody concentrations ≥1.0 IU/mL), and diphtheria toxin (% participants with antibody concentrations ≥1.0 IU/mL) were non-inferior to those observed after DAPTACEL and IPV. The pertussis anti-fimbriae GMCs were marginally lower when Menactra and DAPTACEL were administered concomitantly. CDC. Guillain-Barré syndrome among recipients of Menactra® meningococcal conjugate vaccine-United States, June 2005-September 2006. MMWR Morb Mortal Wkly Rep 2006;55:1120-1124. Erratum in: MMWR Morb Mortal Wkly Rep 2006;55(43):1177. Harvard Medical School/Harvard Pilgrim Health Care Institute. Risk of Guillain-Barré Syndrome Following Meningococcal Conjugate (MCV4) Vaccination. Final Study Report, Revised March 11, 2010. Mueller JH, et al. A protein-free medium for primary isolation of the gonococcus and meningococcus. Proc Soc Exp Biol Med 1941;48:330-333. Watson RG, et al. The specific hapten of group C (group IIa) meningococcus. I. Preparation and immunological behavior. J Immunol 1958;81:331-336. Mueller JH, et al. Production of diphtheria toxin of high potency (100 Lf) on a reproducible medium. J Immunol 1941;40:21-32. Mäkelä PH, et al. Evolution of conjugate vaccines. Expert Rev Vaccines 2002;1:399-410. Goldschneider I, et al. Human immunity to the meningococcus. I. The role of humoral antibodies. J Exp Med 1969;129:1307-1326. Maslanka SE, et al. Standardization and a multilaboratory comparison of Neisseria meningitidis serogroup A and C serum bactericidal assays. Clin and Diag Lab Immunol 1997;4:156-167. Single-dose vial, 0.5 mL (NDC 49281-589-58). Supplied as a package of 5 vials (NDC 49281-589-05). Store at 2° to 8°C (35° to 46°F). DO NOT FREEZE. Frozen/previously frozen product should not be used. Do not use after the expiration date. Vaccine Information Statements are required by the National Childhood Vaccine Injury Act of 1986 to be given prior to immunization to the patient, parent, or guardian. These materials are available free of charge at the Centers for Disease Control and Prevention (CDC) website (www.cdc.gov/vaccines). Potential benefits and risks of immunization with Menactra. Potential for adverse reactions that have been temporally associated with administration of Menactra or other vaccines containing similar components. Reporting any adverse reactions to their healthcare provider. The Sanofi Pasteur Inc. Pregnancy Registry, as appropriate [see Pregnancy (8.1)]. Menactra® is a registered trademark of Sanofi, its affiliates and subsidiaries.